Whynde Kuehn, Cutter Consortium Senior Consultant and Founder of S2E Transformation Inc., postulates that Enterprise Architecture (EA) faces an uphill battle in delivering its intended value proposition. She acknowledges that EA has come a long way in recent years by providing an enterprise perspective and needed structured thinking to business-critical activities. In this Cutter white paper, Kuehn lays out eight key business priorities that EA teams should consider in 2019 and describes how EA can add value to each priority. (Requires Cutter Membership). 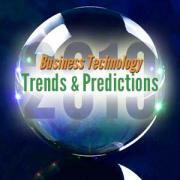 Continuing its tradition of weighing in on prediction and trends, Cutter Consortium's Business Technology Journal serves up a collection of experts to voice their insights on the strategies, technologies, and business models that will impact business transformation in 2019. (Requires Cutter Membership). Authored by Whynde Kuehn, this three-part Executive Update, published by Cutter Consortium, focuses on methods to accelerate the development of an organization’s business architecture. (Requires Cutter membership). In this engaging white paper, Whynde Kuehn, thought leader and accomplished climber, applies metaphors of mountaineering and a formidable mountain to articulate the vision of what is possible with business architecture and shares wisdom on how to achieve success. 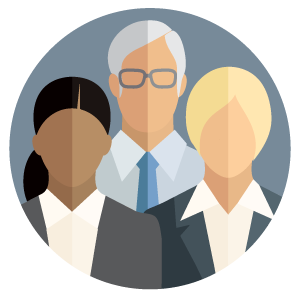 This white paper provides practical guidance and useful best practices to successfully establish a business architecture team within an organization. The work is based on more than a decade and a half of firsthand experience with business architecture teams around the world, as well as work with various industry bodies and thought leaders. Cutter Senior Consultant and S2E Principal Whynde Kuehn and Cutter Fellow and TSG, Inc. President William Ulrich teamed up to create a four-part series highlighting business architecture’s role as a critical enabler of organizations to effectively operate, transform, and compete. The complete series of Executive Updates is available to exclusively to Cutter members. The way we interact with business is changing, from online to offline. Organizations are going through fundamental upheaval. At the heart of this change is the business architect. Once considered a niche role, the business architect is now one that most organisations have on the employee headcount, for tackling strategy to leading and shaping transformation. This white paper provides a simplified and consolidated summary of how business architecture interacts with a common set of teams within an organization, reflective of the most recent industry advancements and consensus. This work also offers an overview of how to perform business architecture integration activities with other teams. In today’s highly competitive business environment where constant change is the new normal, the imperative for unified business direction has never been more important. Yet all-too-many enterprises have siloed business practices. These isolated business units, product lines, or other organizational constructs hamstring strategic execution that in turn leads to sub-optimal customer experiences, expensive redundancy, increased time to market and reduced competitiveness. What if strategy execution were approached from an enterprise perspective instead of in silos? This white paper explores business architecture as a means to integrated business direction that is collectively architected, prioritized and planned from a business-driven, top-down approach. The need for business architecture has never been greater than it is now. Most organizations have evolved to become tremendously complex structures, which are now colliding with a world where constant change is the new normal. 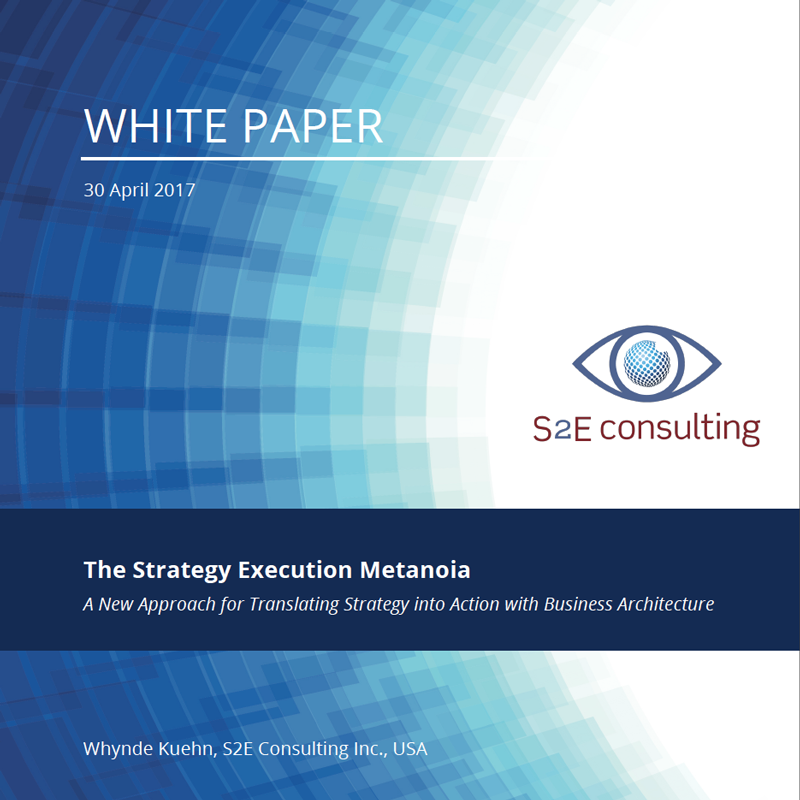 This in-depth white paper explores how business architecture is essential for simplifying organizations and enabling a more effective approach to executing business direction. Even though formalization has taken root in the discipline, confusion still exists about what business architecture really is—and is not. This tight, well-organized primer assists the reader in cutting through the myriad of content available on the topic of business architecture. This publication is intended for Business Architecture Practice Leaders and Practitioners. It is also helpful for executives or any other business or IT roles who would like to gain a more in-depth understanding of business architecture. Revised 04/25/2018. A presentation by S2E Founder, Whynde Kuehn, at the Business Architecture Guild Innovation Summit in June 2015 in Berlin. The presentation covers the value proposition of business architecture and how to communicate it. A presentation by S2E Founder, Whynde Kuehn, and industry thought leader Jeff Scott, at the Business Architecture Guild Innovation Summit in March 2015 in Reston. The presentation covers the importance of a defined strategy execution value stream, the role of business architecture and how to integrate business architecture into the value stream. A Business Architecture Guild white paper for which Whynde Kuehn, S2E Founder, was a reviewer. This white paper establishes the relationship between business architecture and business process and was created through a collaborative process between both communities. A Business Architecture Guild white paper for which Whynde Kuehn, S2E Founder, was a reviewer. 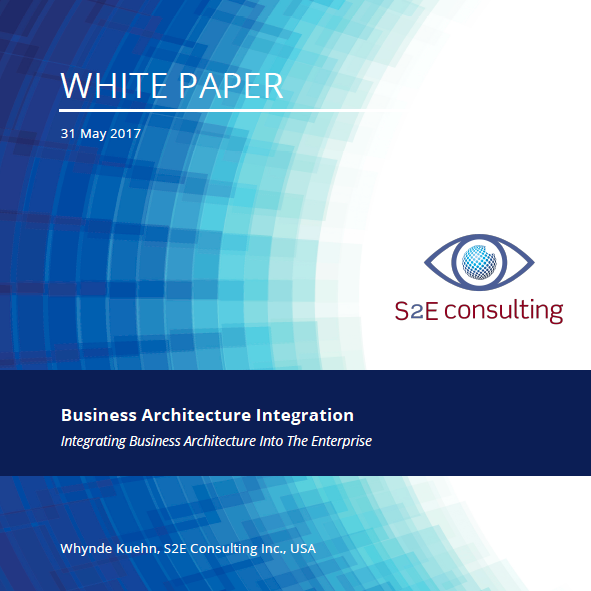 This white paper establishes the relationship between business architecture and business requirements.